I've read the manga first before stumbling across the LN or WN. Frankly, I don't mind the ML overbearing and yandere tendencies because I think it's just the same as any other novel I've read here. Granted, the other ML (of other novel) possessiveness were there but not highlighted because the author focus more on their journey, growth and adventure rather than the romance. 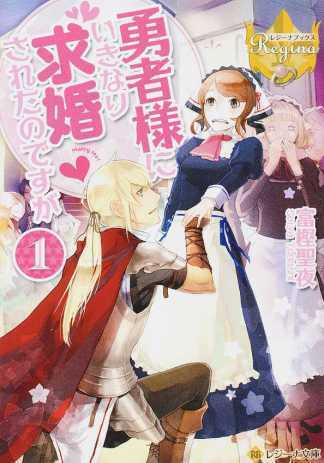 Even the title is 'The Hero Suddenly Proposed to Me, But...' so what do you expect? The MC would suddenly go on a journey and made a... more>> breakthrough to Mid-Level Xiantian? Please. Up until CH2 of V1 I rather enjoyed what I was reading, you know? You see, if you read the Title, description, and the associated tags you have a story about a hero who go's above to norm to propose to some character with no real relation to the story. ... more>> It could have been wonderfully adorable and romantic. Yet the actual story has nothing to do with Romance or Comedy? You see that "Male Yandere" tag? Yea, that's the entire novel in a nutshell. Now that's it for my non spoiler-ish review alright? If you read the continuation of my review it pretty much explains the entirety of up to CH23 in a shorter form. The Male lead A.K.A the "Hero" is a yandere creep of a stalker who quite literally forces the marriage onto the Female lead. Aria after hearing what she can about the "Hero" almost immediately go's to try and quit her job and leave the country, but is stopped by one of the "Heroes" party members as soon as she tells the Princess of her plans. Which also irks me a bit by the way, EVERYONE is working together to get Aria to accept his proposal (Except maybe 1-2 people who are never heard in their rejections). I mean he literally puts a device on her wrist in the form of a Marriage bracelet that not only ties their lives together (yea if one dies so does the other...), it also has a magnetic effect pulling them together. The "Hero" seems to force anyone getting between his getting married to her with force. Not to mention I saw one of the later volume covers showing Aria being held in the "Heroes" arms while smiling..... yeaaaaaa not likely. Her only skill lets her view things in a realistic manner as well as be blunt with her opinions on things around her. The only way that cover will be true is if she is brainwashed or he saved her life or something from let's say a demon out for revenge against the hero. But even that would probably not happen since all the past stuff would be such a turn off for a relationship that any woman except one that is really into having other decide their every life function. Imagine a complete stranger suddenly proposing to you. You can't reject or anything because threats and he's a yandere stalker walking nuke. You've suddenly lost your freedom and right. You're weak and powerless, you have no say, can't make your own decisions, can't choose or love anyone else. Whether you like it or not, you're now chained to him. Your future is literally taken away from you. I'm interested in seeing where this series goes.